Edinburgh : Alex. Strahan, 1858. First edition. 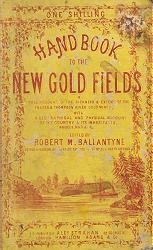 A very scarce little handbook fanning the flames of the latest gold-rush. Chapters on the richness and extent of the gold discoveries in British Columbia; the climate; routes; coasts and harbours; native tribes, etc., with appendices on the Hudson's Bay Company, wages, treaties, diggers' licences, prices of provisions, distances, etc. Foolscap 8vo (18cm). iv,116pp. Folding map of British Columbia, with the goldfields highlighted. Original pictorial boards; neatly repaired, refurbished, rejointed and rebacked in a plain cloth; boards a little marked and scuffed; some internal spotting; a few slight marks and faint creases, but a good copy. Just five copies located in major libraries worldwide - none in North America. BALLANTYNE, R.M. (Robert Michael), 1825-1894 : THE LAKES OF KILLARNEY. London : T. Nelson & Sons, 1859. 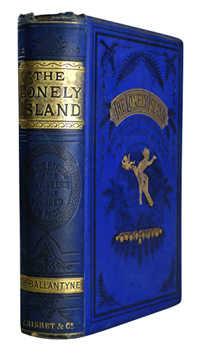 First edition : the first issue, with the map printed in purple. A charming little tourist guide to the Irish Lakes, illustrated with the distinctive and recently introduced two-colour lithographs made popular by the Nelson firm. Foolscap 8vo (18cm). (112) + 16pp inserted advertisements dated May 1858. Frontispiece, folding map and eleven plates. Original decorative cloth gilt; spine just a touch darkened; some very minor wear at tips; a few faint marks; some spotting to prelims and adverts, but overall a very good copy. Gift inscription dated Christmas Day 1859 from Mrs Hunter to Miss Read on front free endpaper. BALLANTYNE, R.M. (Robert Michael), 1825-1894 : THE LIFEBOAT : A TALE OF OUR COAST HEROES. London : James Nisbet & Co., 1864. First edition. "A very stirring and interesting tale of the sea and its perils ... the services rendered by lifeboats in the saving of shipwrecked crews are cleverly woven into the narrative" (London Daily News, 23 November 1864). Foolscap 8vo (18cm). (viii),392 + 16pp advertisements. Frontispiece, extra pictorial title and four plates. Original pictorial cloth gilt; some minor rubbing and marking; a few spots and small flaws, but a very good copy of an uncommon early Ballantyne. BALLANTYNE, R.M. (Robert Michael), 1825-1894 : THE LONELY ISLAND : OR THE REFUGE OF THE MUTINEERS. London : James Nisbet & Co., 1880. First edition. Ballantyne's fictionalised take on the Bligh Mutiny, Fletcher Christian, Pitcairn, and subsequent events. Crown 8vo (20cm). (viii),(414),[ii],(16)pp. Frontispiece, extra pictorial title, and four plates. Original blue pictorial cloth gilt over bevelled boards; some minor rubbing and wear; endpapers slightly cracked; a little shaken; a few edge spots, but overall still a good copy. Gift inscription dated 1883 to William Lawrence from Howard Gilliat (1848-1906). BALLANTYNE, R.M. 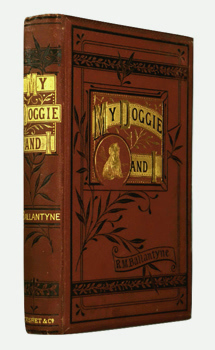 (Robert Michael), 1825-1894 : MY DOGGIE AND I.
London : James Nisbet & Co., 1881. First edition. “Highly realistic and true to nature. Some of the ruffians of society, particularly burglars, are described in such a way as shows that Mr. Ballantyne must have made them a study; while all who know anything of the shady side of life in general in our large cities and towns will see that the author, like Dickens, writes from personal observation. Conspiracy and villainy, innocence and tragedy ...” (Liverpool Mercury, 24 November 1881). Crown 8vo (19cm). [x],(206),[ii]pp. Frontispiece by Walter James Allen, and six illustrations, five full-page. Original pictorial cloth gilt over bevelled boards; all edges gilt; just a touch of rubbing; some rust to staples, but overall a very good copy. Inscribed to Harriet Hardy as a Wickham St Paul’s Sunday School prize, Christmas 1884 – the recipient was the sixteen-year-old daughter of an Essex agricultural labourer. A later (1909) gift inscription bequeathes the book in turn to her daughter, Ivy M. Pilgrim, with “mother’s love”. BALLANTYNE, R.M. 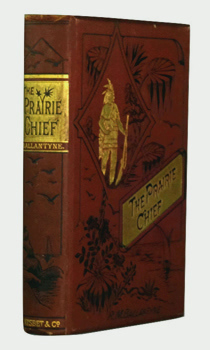 (Robert Michael), 1825-1894 : THE PRAIRIE CHIEF : A TALE. London : James Nisbet & Co., 1886. First edition. “Indian stories are sure of readers, and the scenes of wild life, sport, and exciting adventures admirably described ... will fire the imagination of many a youth. A vein of poetic imagery quite in harmony with the wilds where the scenes are laid runs through the tale” (Leeds Mercury, 3 November 1886). Crown 8vo (19cm). 8,256pp. Frontispiece, extra pictorial title and ten full-page illustrations. Original pictorial cloth gilt over bevelled boards; spine a little rubbed; a hint of wear at to extremities; staples a little rusted; a few marks and light spotting to prelims, but otherwise a very good copy. BALLANTYNE, R.M. 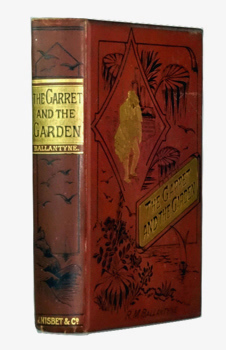 (Robert Michael), 1825-1894 : THE GARRET AND THE GARDEN : OR, LOW LIFE HIGH UP : AND JEFF BENSON OR, THE YOUNG COASTGUARDSMAN. 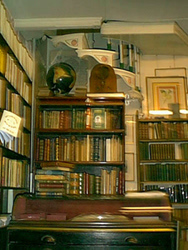 London : James Nisbet & Co., . First edition. Young Scotsman unwittingly enters a Babylonian London underworld, including the remarkable Tommy Splint – “Splint, ’cause w’en I was picked up, a small babby, at the work’us door, my left leg was broke, an’ they ’ad to put it up in splints; Tommy, ’cause they said I was like a he-cat; w’ich was a lie!”. The second novella in this Ballantyne double-bill relates the story of fun-loving, free-and-easy Jeff Benson on the south-east coast. Crown 8vo (20cm). iv,260,32pp advertisements. Frontispiece and three plates. Original pictorial cloth gilt over bevelled boards; spine a touch rubbed; a hint of wear to extremities; some spotting to edges and prelims, but still a very good copy, fresh and bright. Return to First Editions index page.